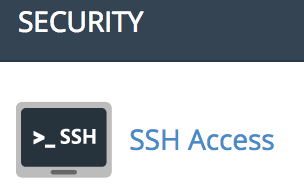 Click SSH Access under Security. Click Manage SSH Keys. This is where you can delete old keys and generate new ones. Click on + Generate a New Key. This will create both a public and private key. Once you have your password set, you can generate your keys. You will notice that the Public Key is not authorized. We need to authorize it before we can download and use it. To authorize the key, click the Manage link. Now go back again to download the keys. It is a good idea to download both keys. When you click on the View/Download link, you’ll see different screens for each key.